I would say that I am pretty qualified to talk about this topic because I have been asked countless times throughout my life if, as a man, I wear makeup on my eyes because they get so dark during the allergy seasons. There’s no doubt that allergies and the sinus congestion that they cause can result in dark circles under your eyes. Thankfully, there are certain nasal sprays for dark circles that have really helped me during those harsh pollen days. The best part is that they are gentle, natural, non-addictive, and cheap. My teenage years were a very confusing period in my life because I didn’t know what was going on with my crazy body. I was having horrible allergy symptoms like severe nasal congestion, excessive sneezing, skin disturbances, and much more in addition to my dark under eye circles and bags. Basically, I looked and felt really bad and I didn’t know why it was happening or what to do about it. Of course, loved ones had offered me allergy medicines like over-the-counter antihistamines and nasal sprays for allergies, but they had never truly worked effectively for me. I eventually noticed that while these allergy treatments worked for a short while, they would eventually betray me in the future by causing physical dependencies or addictions, in addition to another range of side effects that these brought on to add to my symptoms pile with my allergies. Just like somebody who suffers from excess weight or acne, my dark under eye circles negatively affected my self-confidence during a critical period of my development as an adolescent. I really wish that I knew that there were gentle allergy treatments for dark circles caused by sinus congestion that don’t cause any physical addictions or side effects. Let me explain how this is not too good to be true because they really helped improve my bad nasal congestion and the appearance of my dark circles over time. Definitely not as bad now. My dark circles and under eye bags used to look horrible due to my allergies. What Causes Dark Circles When You Have Allergies? In my opinion and experience, dark circles under your eyes and darkness over your eyes, in general, are symptoms directly caused by your allergies. Many informative resources on the internet suggest that nasal congestion causes dark circles, but I think that having sinus congestion is not necessarily a prerequisite for developing dark eye circles in some cases. For me, my sinuses could be completely clear during the allergy seasons and I would still have extremely dark eyes that look like I apply eye shadow or makeup to them. Luckily for me, nasal congestion is not a common symptom for me as an allergic reaction to pollen, but I still experience darkness on my eyes when exposed to allergens in the air. So how do we explain this? Basically, it’s because allergies are not the fundamental cause for dark circles, but they can definitely contribute to the problem. What causes dark circles under your eyes is simply a lack of proper blood flow to the regions around your eyes. This is a particularly sensitive region of your face because it is very thin and near your delicate sinuses, eyes, and mucous membranes. Therefore, when blood vessels are restricted for whatever reason, darkness will result under your eyes. The same can be said about any area of your body. The general rule of thumb is that whenever your skin presents darkness, like with a bruise, you can assume that it is due to a lack of proper blood flow to the area. Proper circulation brings color, vibrancy, and radiance to your skin. When you are congested, the mucus that is clogging up your sinuses is physically pushing against the region under your eyes, which can restrict blood supply to that area. If you’ve ever noticed, when you touch under your eyes when you have dark circles, the region is thinner than it usually is when your eyes are their normal color. That’s because something is either physically or chemically restricting proper circulation in your face. Your real fundamental solution to curing under eye dark circles is to find out why this is happening to your face. Consumption of vasoconstricting drugs like caffeine, amphetamine, etc. For me, a plethora of remedies help improve my eye darkness naturally over time. That includes getting an appropriate amount and better quality sleep, drinking enough water and electrolytes for proper hydration, getting enough exercise but not too much, and massaging my face when I feel pressure and inflammation. However, when I have severe nasal congestion due to allergies, which causes dark circles, a nasal spray decongestant works wonders for me. One in particular has really changed the game for me, the appearance of my dark circles, and my allergies. That was natural and gentle allergy nasal spray with xylitol as its active ingredient, rather than a harsh steroid that can affect your body adversely and cause an addiction that will worsen your dark circles and eye bags over time. Xylitol is a gentle and natural allergy treatment that can relieve inflammation in your sinuses and effectively clear nasal congestion. This stuff is a natural derivative of sugar that is not only a calorie-free natural sweetener, but a provider of numerous health benefits for our body. This stuff is what I’m talking about. Best nasal spray I’ve ever tried and it got rid of my dark circles. This is the best price I’ve found. As a natural saline nasal spray, xylitol effectively treats congestion caused by allergies, sneezing, nasal drip, among many other symptoms. I have noticed that using this allergy spray when I have congestion has helped improve the appearance of not only my eyes, but my entire face. 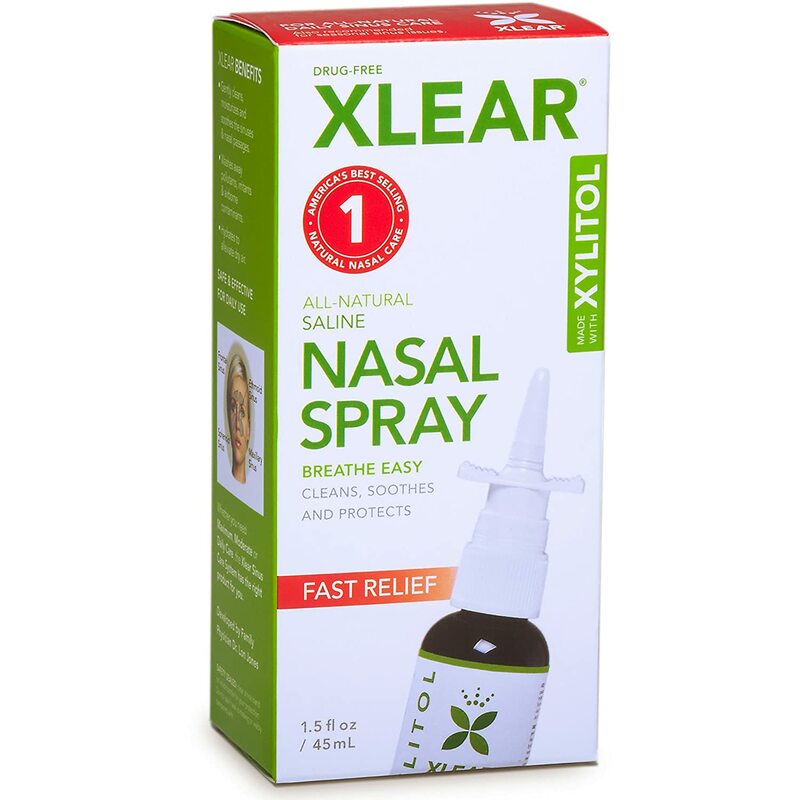 I highly recommend you replace your druggy nasal spray with something that causes no side effects and doesn’t harm your health in any way, like this xylitol spray does. It works as effectively as a neti pot, but the spray is way more convenient and it can be used as many times as you like throughout the day. You won’t have to worry about overdosing on this natural congestion treatment. Check out the lowest price that I’ve found for it that I buy on Amazon. With the right treatment, dark circles are a reversible condition that can stabilize itself normally. Especially if they are caused by your allergies, dark circles can definitely improve with the right treatment. Do Allergies Cause Dark Circles? Yeah, allergies can cause dark circles if you suffer from nasal congestion as a symptom. Congestion of the sinuses can put pressure on the under eye area and restrict proper blood flow or dilate the blood vessels. This causes the skin under the eye to thin and appear dark due to lack of oxygenated blood. Do Dark Circles Go Away on Their Own? Yes, dark circles will go away with proper treatment, especially if they are caused by the congestion that you experience due to your allergies. They should improve over time if you are sleeping properly, staying hydrated, and avoiding drugs. Are Dark Circles Under Eyes Normal? No, dark circles aren’t normal because they indicate that there is improper blood flow in your face. This could be due to many reasons. If you have a question or something to add about the topic of nasal spray for dark circle treatment, please leave it below for me to answer! Great post and site! Thanks for sharing your experience. I have dark circles under my eyes but don’t have nasal congestion. Although I have a food intolerance which is under control. Could nasal spray work for me? I don’t think you should use Afrin or any potentially addictive stuff. But the natural nasal spray that I use with xylitol is extremely gentle and has health benefits. I would definitely try that first. Yup. I have found that neti pot does wonders for my tired-looking eyes and dark circles. I do believe genetics play a role, because it runs in my family (I’m more fortunate than the other members whose condition is worse). Thanks for the post!